Prior to moving to a new place, one’s life is consumed with the task of finding moving boxes. After a move, one’s life becomes consumed with the question of what to do with all those moving boxes. Well, with a little creativity and effort, moving boxes can be re-purposed into unique items that can entertain the kids, help you to organize your home and much more! Here are some ideas that will help you make use of this sea of cardboard we all find ourselves surrounded by after moving. Make a playhouse: Small children will love this one. Because cardboard boxes come in all sizes, it is relatively easy to fashion a fort or playhouse for your children who will love spending hours within them. Knee pads: Are you someone who likes to putter around the garden? Well, if you are you will often find yourself in the uncomfortable position of bending down on one or both knees. In order to spare your knees and your pants, try fashioning knee pads out of a cut piece of cardboard. 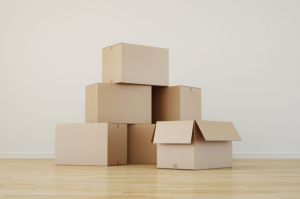 Sell your boxes: Did you know you can actually sell your intact moving boxes to others who are going through the moving process or who need them for storage? You can sell your used boxes on sites like Craigslist, NextDoor, etc. If you are feeling altruistic, you can of course give them away as well. Signs: Need to advertise a bake sale, garage sale or some other venture? An old piece of cardboard makes a great canvass for your advertising message. Children’s’ toys: Cardboard boxes can easily be fashioned into shapes, letters, etc., for small children to play with and learn from. Once you have made these pieces, color them for even more variety. Cat scratching surface: Does your cat like to scratch up your valuable items? Of course it does. Try wrapping cardboard around the legs of furniture and anything else your cat likes to scratch in order to protect it and preserve your sanity. Coasters: With a little cardboard, some duct tape and a pair of scissors you can make some pretty nifty coasters that will protect your furniture and look great at the same time. There you have it. Those are just a few things you can do with all those boxes. Of course, you can also keep your boxes intact and use them to store items in general or you can use them to transfer the items you wish to house at our Calabasas moving and storage facility. Our Pasadena moving company can help you with your move and help you securely store items you will not be moving into your new home right away.